One of the basic table tennis rules is about making a good return. 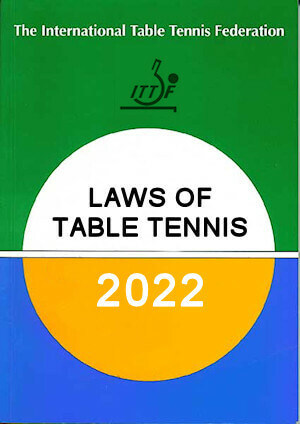 The official rules of table tennis are a comprehensive set of rules and regulations which cover a multitude of situations which may arise during a game. But let's just take a look at a few of the basic table tennis rules which deal with making a good return. We'll look at what constitutes a good return and answer questions such as whether you can you use your hand to play a shot. We'll also look at what happens if you move the table, touch the playing surface or touch the net. Striking the ball - what is a good return? You can read more about the racket (also known as a paddle or bat) here. This means that all of the following are legal and will constitute a good return. However ... your hand is only your racket hand if it's holding your table tennis racket. This means that you can't drop your racket and then hit the ball with your hand ... because your hand is no longer your racket hand. Additionally, you can't make a good return by throwing your table tennis racket at the ball. You must be holding your racket when it hits the ball for it to be a good return. Of course, you could transfer your table tennis racket from one hand to the other hand because your other hand would then become your racket hand ... but that's quite difficult to do! However, Andrzej Grubba of Poland was particularly good at that. Here's a short video clip which shows him transferring his table tennis racket from his right hand to his left hand during a rally. Unless the rally is a let, a player shall score a point if an opponent, or anything an opponent wears or carries, moves the playing surface. This means that if you cause the table tennis table to move whilst the ball is still in play, you lose the point. This usually happens when you rush forward to play a shot. After you've played your shot, your forward momentum can cause you to move the table. However, if the ball wasn't in play when you moved the table tennis table, there's no penalty. For example, once the ball has bounced a second time (either on the table, floor, surroundings, or hits your opponent), the ball's no longer in play. Here's an example of World number one, Ma Long (red shirt), moving the table during a rally. You can see that Ma Long serves, then Simon Gauzy (blue shirt) returns the ball. As Ma Long steps forward to play his next stroke he accidently moves the table. However, Simon Gauzy obviously didn't notice that Ma Long had moved the table and continued to play ... ending with a fabulous backhand smash. But the outcome was already decided as soon as the table was moved by his opponent ... and the point was awarded to Simon Gauzy. Any strokes played after the table was moved were irrelevant. The umpire then re-measured the height of the net to make sure that it hadn't changed when the table was moved. Unless the rally is a let, a player shall score a point if an opponent's free hand touches the playing surface. This means that if you touch the playing surface (i.e. the top of the table tennis table) with your hand which is not holding your racket whilst the ball is still in play, you lose the point. So, if you're right handed and have your racket in your right hand, and you touch the playing surface with your left hand, you lose the point. 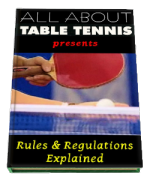 However, as long as you do not move the table, you can touch the table with your racket or any other part of your body without penalty. Unless the rally is a let, a player shall score a point if an opponent, or anything an opponent wears or carries, touches the net assembly. This means that if you touch the table tennis net or the net posts whilst the ball is still in play, you lose the point. As with moving the table tennis table, this usually happens when you rush forward to play a shot and your forward momentum may cause you to touch the net.